Who needs a break?! A day away at the spa? Mamas, business women, and all of you generous ladies giving of yourself ALL.THE.TIME. Take some time and space to breathe, ponder, dream, write, doodle, and create your ideal life (and start making it a reality). Use meditation, breathing exercises, physical yoga practice, journaling, and most importantly, quiet time away from your regular routine to get clarity on what you really want, and to become aware of current thought patterns and repetitive behaviours that may be holding you back. Relax and enjoy the spa and the company of other women! 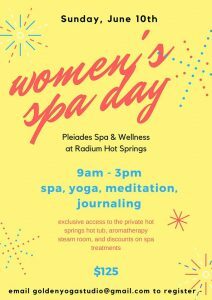 3 – 5 book a massage or spa treatment, or simply enjoy the private hot springs hot tub, aromatherapy steam room, and treats! You will leave feeling inspired, refreshed, and energized!